We put Ana Ivanovic fans to the test to see how well they know Ana in our Ana Ivanovic Fan Challenge. We asked Ana some questions to see if her fans could get the answers right and Ana tweeted about it to her 759,000 fans. The video received over 500,000 views in the first week and we all learned a lot more about Ana. We teamed up with team Ivanovic to give one lucky fan a signed visor from Ana, herself. In order to enter the contest, Ana tweeted her 663,000 followers these instructions-- watch the Outside the Ball video to learn her signature pose, then tweet a photo with their best #AnaPose. @TatiAnaIvanovic was the big winner! Watch the video to learn Ana's signature pose. We put Tomas and Ester Berdych to the test to see how well they really know each other. They had so much fun playing the Outside the Ball Newlywed Game that Tomas tweeted the video to his 256,000 followers and the video was retweeted by his fans. The Berdych Newlywed video received over 8,000 views in just two days. Watch the video to see if you think Tomas and Ester are the perfect match. 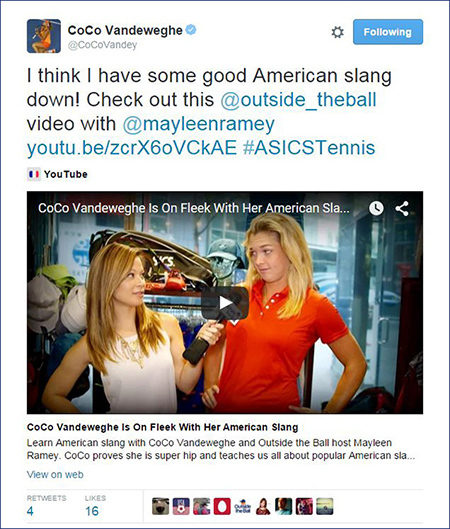 CoCo Vandeweghe proved she is on point with her American slang in our Learn American Slang with CoCo Vandeweghe video. CoCo thought the video was on fleek and tweeted it to her 21,000 followers. Watch the video to learn how to throw shade and give the side eye. 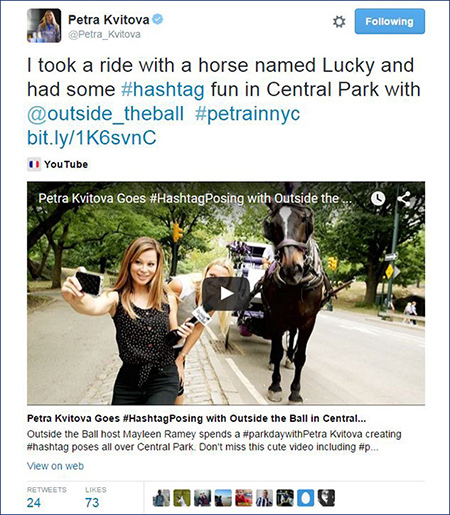 We took Petra Kvitova on a horse and carriage ride through Central Park and asked Petra to create some #hashtag poses. Petra had so much fun that she tweeted the video to her 285,000 followers. The video was retweeted and loved by her fans and received almost 3,000 views in just three days. Watch the video to go #Posing with Petra. The super talented Aga Radwanska teaches us how to travel like a pro and then proves she can tweet like a boss. Aga tweeted our Travel Like a Tennis Pro video to her 204,000 followers and the video received over 70 retweets and almost 12,000 views in just a few days. Watch the video to learn how to travel like a tennis pro. 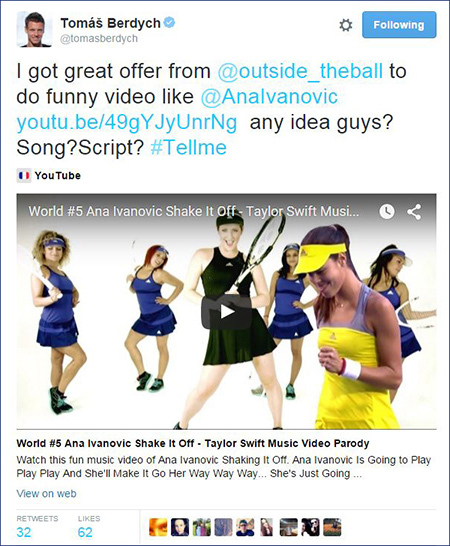 Ana Ivanovic loved our Shake It Off music video so much that she tweeted about it to her 663,000 followers and even showed us how to do the Wave. The Shake It Off music video has received over 340,000 views and is one of our most popular videos to date. Watch the video to see Ana's review of our Shake It Off music video that we created just for her. 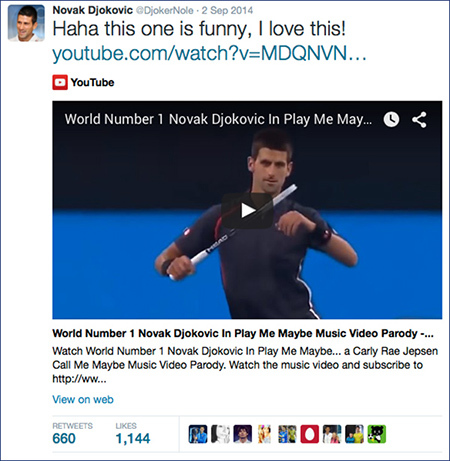 Ana Ivanovic, Agnieszka Radwanska, Dominika Cibulkova and Novak Djokovic all loved the music videos that we created for them so much. When we offered to make one for Tomas Berdych too, he jumped at the chance and asked his 256,000 followers for song ideas. We made a music video about the World #1 and he approves, tweeting this to his almost 5 million followers. The video received over 250,000 views, so apparently his fans love it too!